Still reeling a bit from the twin effects of MacWorld Expo New York, held earlier in July, and a string of blistering hot, humid days with bad air quality, a decent crowd of the semi-awake turned out for the July General Meeting. Fortunately for everyone, it was the first "cool" day in some time, with temperatures "only" in the high 80s. Some at the General Meeting actually complained about the "freezing" air conditioning in the auditorium. Judging by the questions before, during and after the meeting, next month's release of the iMac will need no great amount of hype: the Mac enthusiasts are keenly interested in the stylish sea green (blue?) computer. Several people, in great seriousness, suggested the Pi actively promote itself as "iMac-compatible," since anything remotely connected with this machine gets attention, often at the expense of the more noteworthy. Frank demonstrated Reunion 5.0, a highly regarded genealogy program with an enthusiastic and loyal band of users. Frank has a low-key presentation style, sparked by a gently ironic wit. He never told an explicit joke the entire meeting, yet the audience found many occasions to laugh at his deadpan description of the absurd. Constructing a family history, he would offer such observations as, "If you make a mistake about the wife, just put her in the trash," or "you can remove an entire branch of a family tree by just selecting it and deleting it." The often-comatose Saturday morning crowd perked up to near wakefulness, a tribute to Frank's presentation skills on what could be a very dry topic. Reunion is a Mac-only program, and makes superb use of the Macintosh interface. While there are keyboard shortcuts for almost everything, buttons and tabs make most activities "obvious," and it appears as if a user would have little difficulty creating a basic genealogy with little reference to the manual. Simple family trees, however, are just a beginning for Reunion, which has a vast capacity to accept virtually unlimited personal biographical information, photos, QuickTime clips and other material. Once the material is entered, it can be displayed (and printed) as graphic family trees, timelines, individual "person sheets," pedigree charts, and other types of reports. Reunion can also export information in various word processing formats, as well as HTML format, for publishing on the World Wide Web. 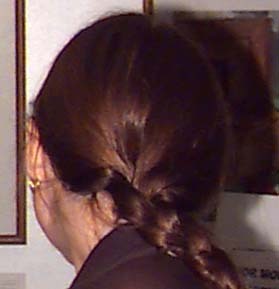 The program can interact with information in several ways, depending on context. You can use a "stack of cards" metaphor for entering information on individual family members. Descendant Charts, on the other hand, are tree structures, with individuals in their own boxes, connected by lines to indicate marriages and offspring and color-coded to show generations; boxes, lines, colors, and other elements can be customized within the application, without resorting to other tools. Extraordinary attention is paid to the often incomplete nature of most genealogy research. For example, you may know that cousin Fred was born on May 12, 1956, but all you know about his father's birth was that it was sometime in the summer of 1921. Reunion allows you to enter "fuzzy" dates, ranging from the precise May 12, 1956 to the vague "summer of 1921," or even "summer of 21." An automatic date calculator keeps track of the age of individuals at different milestones in their lives. If you entered your own birth date, and your wedding date, and the birth date of a child, Reunion could display your age, in years, months, and days, at the time of the wedding and birth of your child. Reunion can also be used as a database. You can use it to search for all family members born in Missouri, or all males born before 1800, or all family members who have "Frank" as part of their names. The attention to detail, and the obvious focus on using it as a tool rather than incorporating features for the sake of features, is clearly evident. Because of other events taking place in the auditorium, the stage was set up with an open orchestra pit, preventing Frank from demonstrating Reunion from the stage. Instead, he sat in one of the theatre chairs in the auditorium, with a PowerBook G3 series laptop and wireless microphone and his back to the audience. Aside from possibly dislocating his spinal cord (from trying to turn around to see those asking questions), he made this potentially awkward arrangement work well, and everyone was extremely impressed with his PowerBook. Sadly, he did not offer it as a drawing prize, despite several suggestions. Michelle McNaught (mczero@erols.com), a regional representative for Alps Electric (http://www.alpsusa.com/), gave the second presentation. Trying to do a presentation on printers is difficult, since a printer isn't nearly as interactive as a software package. So Michelle used a different approach, a mixture of information on Alps and their printers and a seminar on printing. Michelle McNaught brought an Alps printer for display, and opened it up to show the arrangement of ribbons in the printer. Alps a long history in the computer field, but is usually known for their components. Over the past 20 years, many Apple products have had keyboards, floppy drive components, or switches made by Alps, but to most people Alps is an unknown. So Michelle's first task was to provide a brief history, and suggest that Alps printers are not those of some late entry in the field. Instead, they are a new direction: a product they've actually placed their name on, in a visible place. 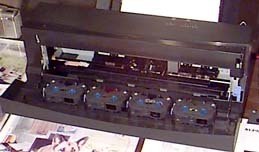 Unlike laser printers, which use a dry powder, or inkjet printers, which use a wet ink, Alps printers use a dry-process printing. In other words, they use ribbons. Michelle explained that this was not a throwback to typewriters, but a "better idea:" injet printing isn't waterproof, and smears, and dry powder printing such as that used in laser printers just doesn't have the same richness as Alps dry-process printing. Over the entire lengthy history of Washington Apple Pi, Michelle was probably the first vendor representative to apologize for not bringing a squirtgun. She explained that, normally, she'd use the squirtgun to spray water on various print samples, which would then be passed around for the audience to examine (and try to smear). Lacking the squirtgun, she used a cup of water to illustrate this point, in some cases thoroughly soaking her samples -- but without smearing the ink. 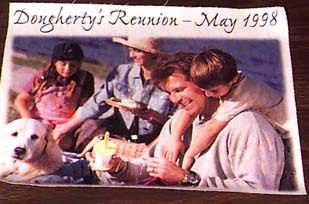 This photograph was printed using Alps iron-on transfer cartridge, and then "ironed" on cloth. Because it is a dry-process printing, Alps printers don't need special paper; a 24 pound laser paper is preferred, but photocopy paper works almost as well. The dry-process printing also allows the user to print on both sides; in many printers, this will cause printed images to smear, or sometimes gum up the printer, causing jams. Alps is pushing the outer edge with this technology: they've developed special ribbons for creating iron-on transfers (for T-shirts), as well as metallic ribbons for printing in gold and silver -- notoriously difficult to do. A special white cartridge was created for producing neutral backgrounds, useful when printing on colored paper. Soon to come: a water transfer cartridge for creating temporary tattoos. For a presentation that didn't use a computer -- she stood in front of the crowd and talked, and passed out print samples -- Michelle ranks as one of the better Pi speakers over the past year. In August: be sure and attend on August 22 as Multi-Ad Services (http://www.multi-ad.com/), the company with a terrible name, demonstrates something with a much-better name and an amazing set of features: Creator2. This elegant design tool is a nice mixture of PageMaker and Quark Xpress with elements of Adobe Illustrator, all in one nice, neat package. It will give you a whole new perspective on what a "page layout" and "design" software package can do. Ah, yes: what happened to Don Essick, the Macintosh Vice President? His kind and thoughtful employer sent him to Dallas in late July to enjoy the record-setting string of 100-plus-degree days. The Pi leadership cooly offered to try and fill his shoes for the month, lacking any desire to join him. He will be back in August, without the Dallas heat (we hope). Pi office manager Beth Medlin has her picture in thousands of Post Offices across the nation, so tries hard to avoid cameras.